Define : i) Free air delivered ii) Compressor capacity iii) Swept volume iv) Pressure ratio, w.r.to compressor. Define i) Free air delivered (FAD) – It is volume of air delivered under the condition of temperature and pressure existing at compressor intake, i.e. volume of air delivered at surrounding air temperature & pressure. In absence of any given free air conditions these are generally taken as 1.101325 bar and 150 c. ii) Compressor capacity – It is quantity of free air actually delivered by compressor in m3 /min. iii) Swept volume – It is the volume of air taken during sanction stroke. It is expressed in m3 . 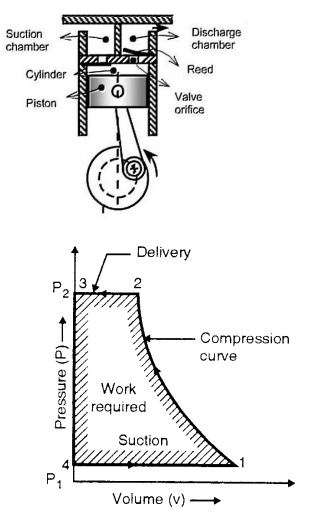 iv) Pressure ratio – It is defined as delivery pressure to suction pressure. Following are the applications of compressed air 1) To drive air motors in coal mines. 2) To inject fuel in air injection diesel engines. 3) To operate pneumatic drills, hammers, hoists, sand blasters. 4) For cleaning purposes. 5) To cool large buildings. 6) In the processing of food and farm maintenance. 7) In vehicle to operate air brake. 8) For spray painting in paint industry. What are the advantages of multistaging ? Explain with sketch working of screw compressor. A rotary-screw compressor is a type of gas compressor that uses a rotary-type positivedisplacement mechanism. They are commonly used to replace piston compressors where large volumes of high-pressure air are needed, either for large industrial applications or to operate highpower air tools. Rotary-screw compressors use two meshing helical screws, known as rotors, to compress the gas. In a dry-running rotary-screw compressor, timing gears ensure that the male and female rotors maintain precise alignment. In an oil-flooded rotary-screw compressor, lubricating oil bridges the space between the rotors, both providing a hydraulic seal and transferring mechanical energy between the driving and driven rotor. Gas enters at the suction side and moves through the threadsas the screws rotate. The meshing rotors force the gas through the compressor, and the gas exits at the end of the screws. Explain the working of two stage reciprocating compressor. 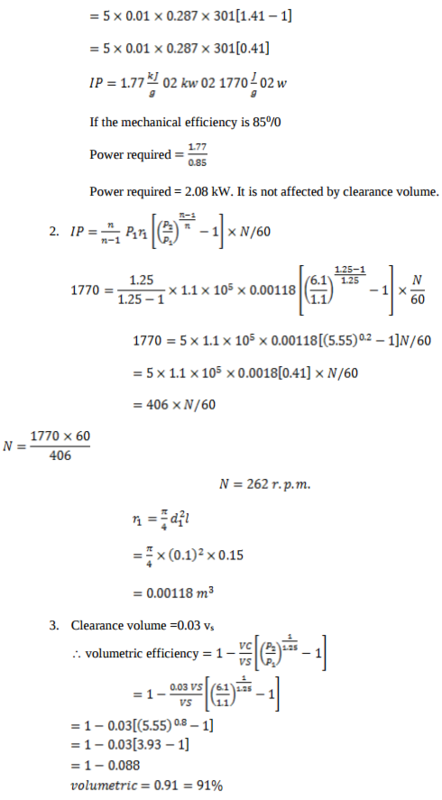 Show work saved on PV diagram. What is the necessity of purification of air ? How to remove oil, moisture and dust from air? The air sucked by the compressor is not clean. It contains various types of solid, liquid and gaseous contaminants such as dust, dirt, moisture etc. The presence of contaminants may have high damaging effects such as corrosion, wear and tear on the finely finished mating surfaces of pneumatic components. Air lines may get chocked or damaged. Therefore, purification of air by removing oil, moisture and dust is done to protect the pneumatic system from failure, so that the system should work efficiently. 1) Particulate Filters ( Dry Air Filters ) Particulate filters are used to remove dust and particles out of the air. This will allow air to travel faster in the piping system and prevent clogs. The main element in this filtration is the membrane. The membrane acts like a gate which only lets air pass through while anything bigger gets blocked by the membrane material. 2) Coalescing Filters Coalescing filters are used to capture oil and tiny moisture droplets and prevent condensate from developing in the system. This will prolong the life of the piping system and other components by avoiding rust. The main component used is the flow of the air. The filter may contain a membrane element in it as well but altering the flow of the air in a tight space causes condensate or oil to gather at the bottom of the filter. Reciprocating air compressor draws 6 kg of air per minute at 25°C. It compresses the air polytropically and delivers it at 105°C. Find the work done by the compressor and air power. 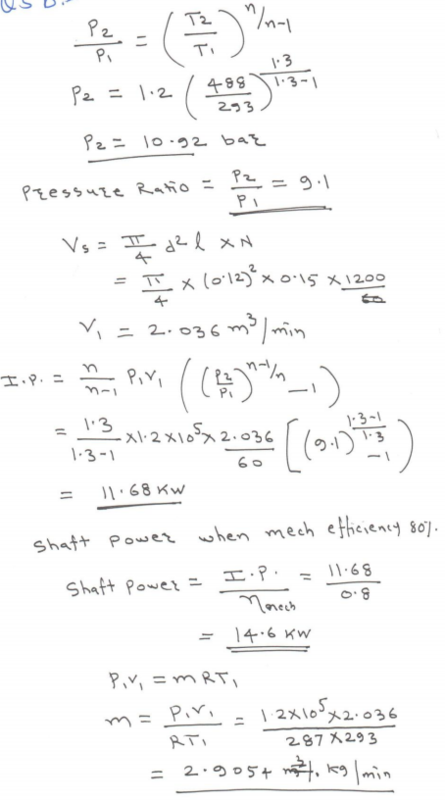 Also find mechanical efficiency if shaft power is 14 kW. Assume R = 0.287 kJ/kg°K and n = 1.3. 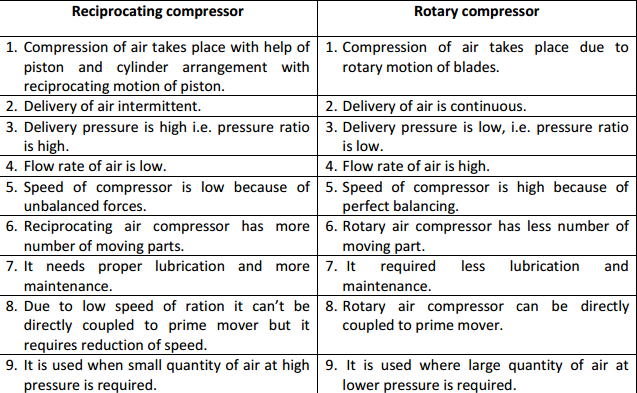 State the methods to improve efficiency of air compressor. Explain two stage air compressor with perfect intercooling with neat sketch. Multistage compression refers to the compression process completed in more than one stage i.e. a part of compression occurs in one cylinder ( L.P. cylinder) and subsequently compressed air is sent to subsequent cylinders ( H.P. cylinder) for further compression. 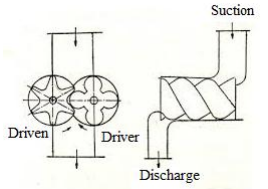 Figure shows the schematic of two stage compressor with intercooler between stages. The total work requirement for running this shall be algebraic summation of work required for low pressure (LP) and high pressure (HP) stages. The size of HP cylinder is smaller than LP cylinder as HP cylinder handles high pressure air having smaller specific volume. Intake temp of air at LP =intake temp of air at HP for perfect intercooling. State the applications of reciprocating compressor and rotary compressor (4 each). Applications of Centrifugal Compressor 1. In gas turbines and auxiliary power units. 2. In automotive engine and diesel engine turbochargers and superchargers. 3. In pipeline compressors of natural gas to move the gas from the production site to the consumer. 4. In oil refineries, natural gas processing, petrochemical and chemical plants. 5. Air-conditioning and refrigeration and HVAC: Centrifugal compressors quite often supply the compression in water chillers cycles. 6. In air separation plants to manufacture purified end product gases. 7. In oil field re-injection of high pressure natural gas to improve oil recovery. Enlist different uses of compressed air. 1) To drive air motors in coal mines. 2) To inject fuel in air injection diesel engines. 3) To operate pneumatic drills, hammers, hoists, sand blasters. 5) To cool large buildings. 6) In the processing of food and farm maintenance. 7) For spray painting in paint industry. 8) In automobile & railway braking systems. 9) To operate air tools like air guns. Define following terms w.r.t. air compressor. i) FAD ii) Compression ratio. i) FAD – It is the volume of air delivered under the intake conditions of temperature and pressure. ii) Compression ratio – It is defined as the ratio of absolute discharge pressure to the absolute inlet pressure. 1) To drive air motors in coal mines. 2) To inject fuel in air injection diesel engines. 3) To operate pneumatic drills, hammers, hoists, sand blasters. 4) For cleaning purposes. 5) To cool large buildings. 6) In the processing of food and farm maintenance. 7) For spray painting in paint industry. 8) In automobile & railway braking systems. 9) To operate air tools like air guns. 10) To hold & index cutting tools on machines like milling. 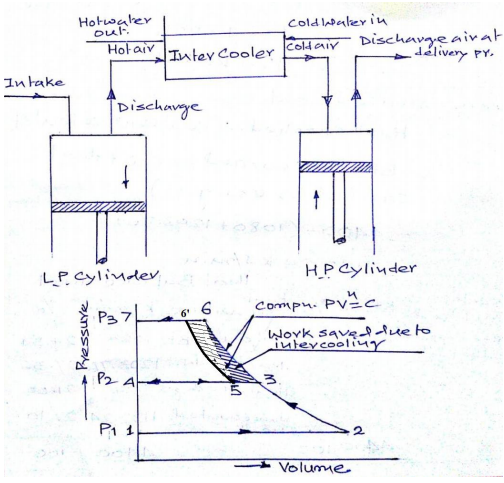 Explain with neat sketch working of lobe type air compressor. Lobe type air compressor: it is a rotary type of compressor consisting of two rotors which are driven externally. One rotor is connected to drive and second is connected to gear. These two rotors have two or three lobes having epicycloids, hypocycloid or involutes profiles. In the figure two lobes compressor is shown with a inlet arrangement and receiver. A very small clearance is maintained between surfaces so that wear is prevented. Air leakage through this clearance decreases efficiency of this compressor. 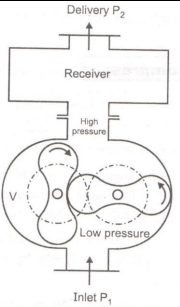 During rotation a volume of air V at atmospheric pressure is trapped between left hand rotor and casing . this air is positively displaced with change in volume until space is opened to high pressure region. At this instant some high pressure air rushes back from the receiver and mixed with the blower air until both pressure are equalized . A two stage air compressor with perfect intercooling takes in air at 1 bar pressure and 27 °C. 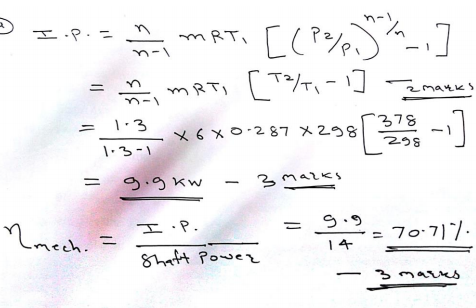 The law of compression in both the stages is Pv1.3 = constant. The compressed air is delivered at 9 bar from the H.P. Cylinder to an air receiver. Calculate per kg. of air i) The minimum work done. ii) The heat rejected to the intercooler. 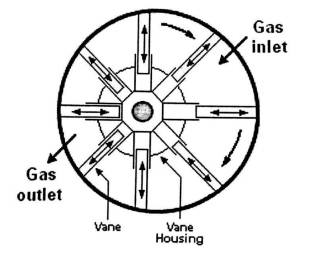 Draw a neat sketch of vane compressor and label the different parts. What is the necessity of multistage compression ? 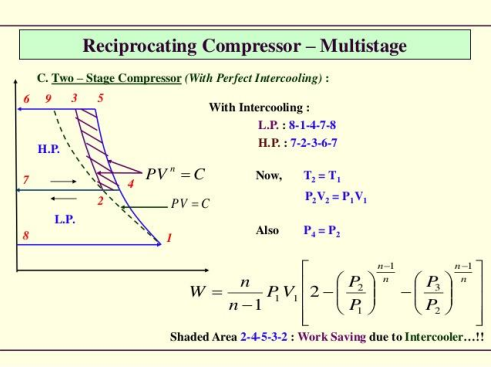 Explain the working of two stage reciprocating air compressor with intercooler, with the help of p-v diagram. Fig. shows arrangement of two stage reciprocating air compressor with inter cooler and its working shown on P.V. diagram plane. 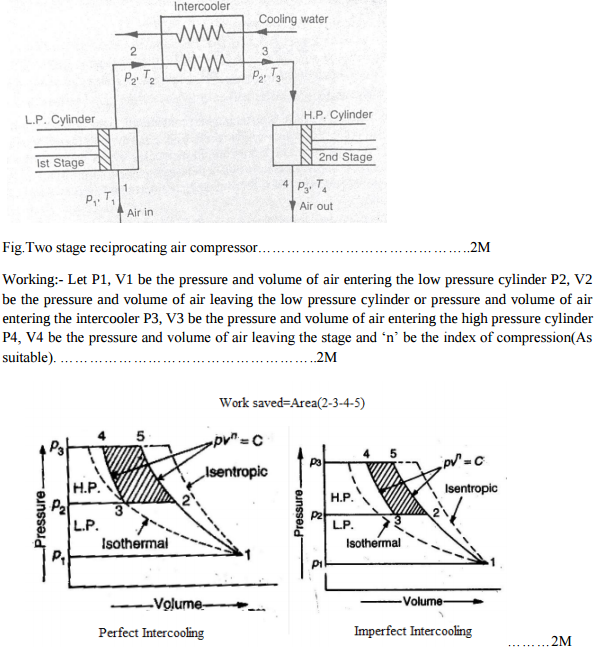 Processes occurred in the cycle  - 1 – 2 – suction process by LP cylinder to draw atmospheric pressure  - 2 – 3 – compression process by LP cylinder up to pressure P2  - 3 – 4 – delivery of compressed air into the air cooler  - 4 – 5 – during this process air rejects the heat to the cold water and at the same time suction process by HP cylinder to draw air from air cooler.  - 5 – 6 – compression pressure by HP cylinder up to required pressure P3  - 6 – 7 – delivery of compressed air at required pressure to the point of use. This completes the process and system has shown saving in work shown by shaded portion. State any four industrial uses of compressed air. 1) To drive air motors in coal mines. 2) To inject fuel in air injection diesel engines. 3) To operate pneumatic drills, hammers, hoists, sand blasters. 4) For cleaning purposes. 5) To cool large buildings. 6) In the processing of food and farm maintenance. 7) For spray painting in paint industry. 8) In automobile & railway braking systems. 9) To operate air tools like air guns. 10) To hold & index cutting tools on machines like milling / cnc machines. i] Compressor capacity:-  It is the volume of air delivered by the compressor in m3 per minute  It is express in m3 /min ii) FAD:-  It is the volume of air delivered by compressor under the intake conditions of temperature and pressure.  Capacity of compressor is generally given in terms of free air delivery.  Unit = m3 /cycle iii) Volumetric Efficiency: It is the ratio of actual volume of air delivered at standard atmospheric condition discharge in one delivery stroke to the swept volume by the piston during the stroke.iv) Mechanical Efficiency: It is the ratio of Indicated power to shaft (brake) power. A pneumatic rock drill requires 10 kg/min of air at 6 bar pressure. Find the power required to drive the single acting single stage reciprocating compressor receiving air at 1 bar and 27°C. Assume mechanical efficiency as 80% and value of index, n as 1.25. 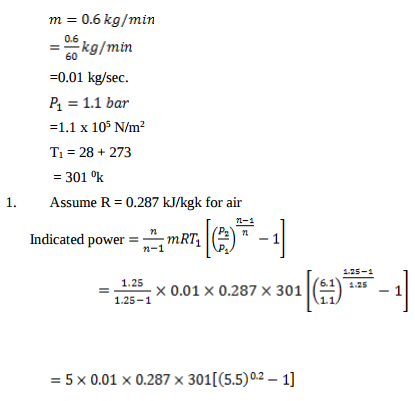 Take Cp = 1.005 kJ/kgk and Cv = 0.718 kJ/kgk for air. 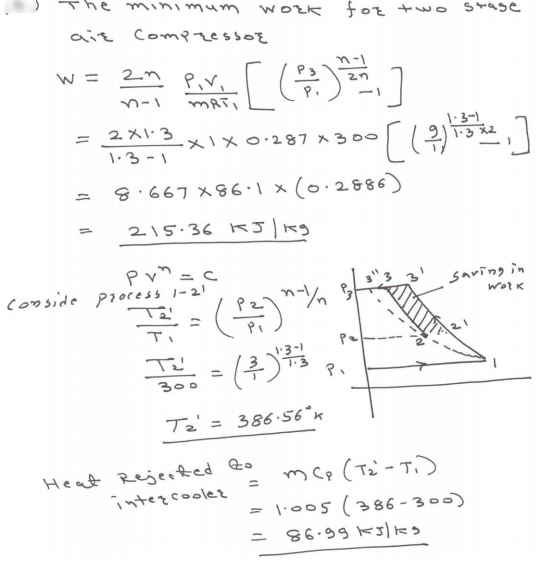 Also estimate isothermal efficiency of compression. 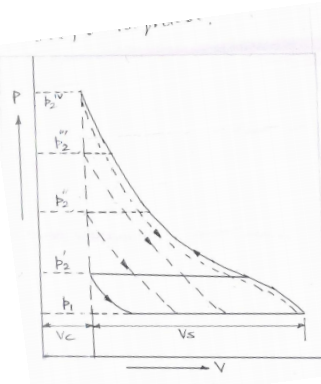 Show the effect of increase of compression ratio in a single stage reciprocating compresor on PV diagram and give its physical significance. If compression in increased (usually it varies from 5 to 8) the final temperature increases and volumetric efficiency decreases flow and it compression ratio increases beyond usual value, compression ratio P2/P1 becomes zero as it can be observed from the figure. Increment in compression ratio will increase leakage past the piston and will need robust cylinder. If will also affect the operation of delivery valve and if will reduce lubricating properties of oil. It may increase the risk of ignition in piping and receiver. The criterion of the thermodynamic efficiency of a reciprocating compressor is isothermal compression while for rotory compressor it is isentropic compression. Discuss the reason for this. Compare reciprocating compressors and centrifugal compressors on the basis of the following parameters: 1) adaptability 2) suitability 3) mechanical efficiency 4) capacity of delivering volume. 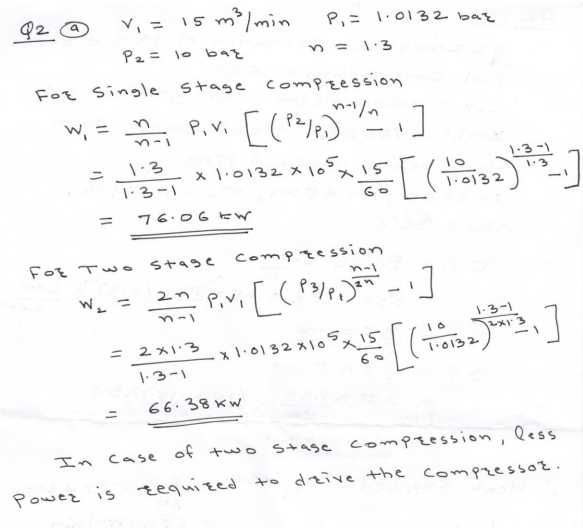 Define displacement of compressor for two stage compressor. 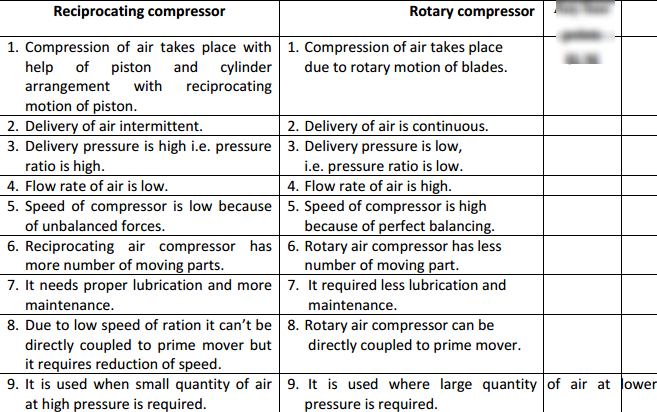 Why is free air delivered less than displacement of compressor? 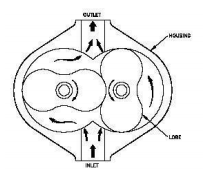 Rotary Lobe type Air Compressor has two mating lobe-type rotors mounted in a case. The lobes are gear driven at close clearance, but without metal-to-metal contact. The suction to the unit is located where the cavity made by the lobes is largest. As the lobes rotate, the cavity size is reduced, causing compression of the vapor(air) within. The compression continues until the discharge port is reached, at which point the vapor exits the compressor at a higher pressure. Explain construction and working of single stage reciprocating air compressor with neat sketch. Also represent it on P-V diagram. 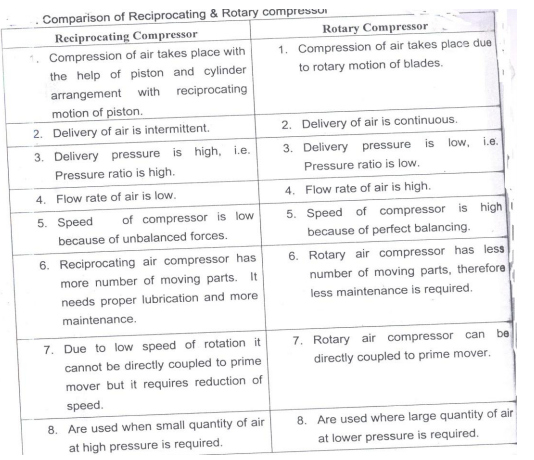 Compare reciprocating and rotary compressors (any four). Write any four applications of compressed air. 10) To hold & index cutting tools on machines like milling. Define : i) Isothermal efficiency. 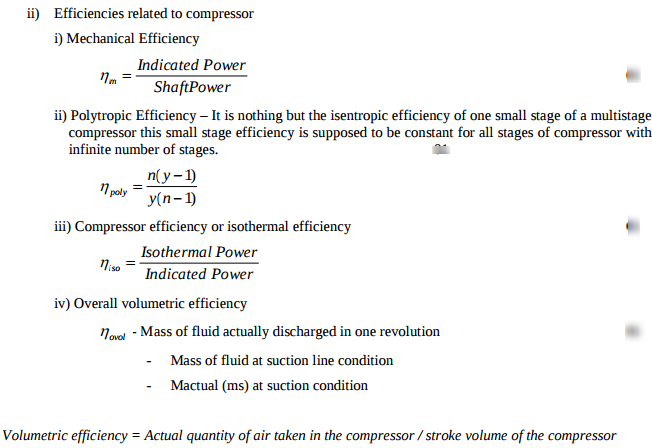 ii) Volumetric efficiency with respect to air compression. 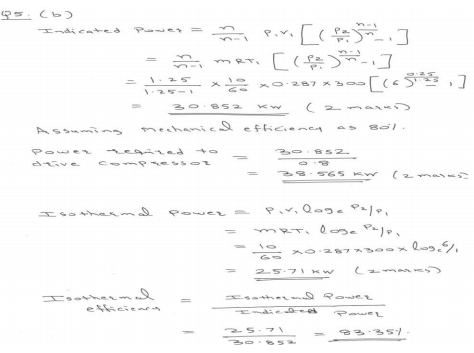 i) Isothermal efficiency – It is defined as the ratio of isothermal power to the indicated or actual power. 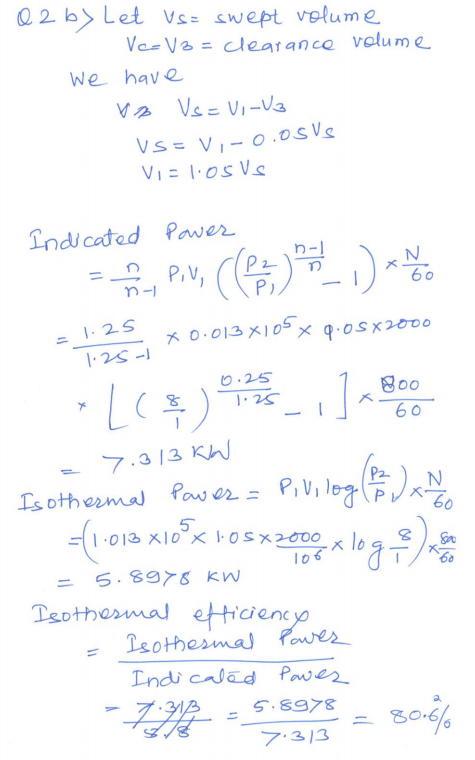 Isothermal efficiency = Isothermal power / Indicated power. ii) Volumetric efficiency – It is the ratio of actual volume of the free air delivered at standard atmospheric condition at discharge in one delivery stroke to the swept volume by the piston during the stroke.